The Memorial Day weekend event garnered a live gate of $3,428,775. Of the 14,674 folks in attendance, the NSAC reports 11,428 fans paid to enter the venue, while 3,246 people received complimentary tickets. There were 276 unsold seats. The official numbers are nearly identical to what UFC president Dana White reported during the UFC 146 post-fight press conference. White said 14,592 fans had packed the arena, generating $3.4 million at the door. The pay-per-view’s featured attraction showcased a heavyweight title tilt between champion Junior dos Santos (Pictured) and Frank Mir. 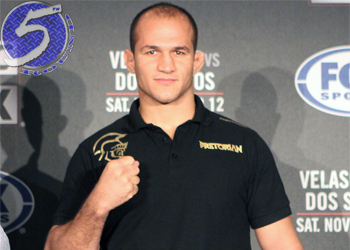 “Cigano” easily disposed of Mir to successfully defend his throne. Dos Santos was originally slated to headline the show opposite Alistair Overeem. If “The Demolition Man” hadn’t flunked his pre-fight drug test to ruin the blockbuster shootout, the official attendance and gate numbers would have been drastically different.